Location: Brighton Racecourse, Brighton, East Sussex, UK. In contrast to last year's show, the weather was a bit brighter, and more importantly dry, which led to a far better turnout for the American classic cars (a few ringers swelling the numbers) with about 25 on show throughout the day, although the sun didn't really come out until everyone was leaving. Entrance to the show cost £6 ($12/€8) per adult, £4 for children and a £16 family ticket (2 adults, 2 children) was also available. Those exhibiting cars and the dance demonstrators got in free, though they were asked to make a nominal donation. 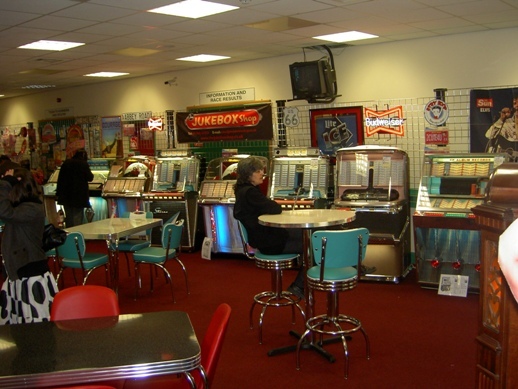 Inside, there was a vast selection of jukeboxes and other '50s memorabilia, everything from retro clothes to film posters and vintage kitchen equipment - cream horn moulds anyone? 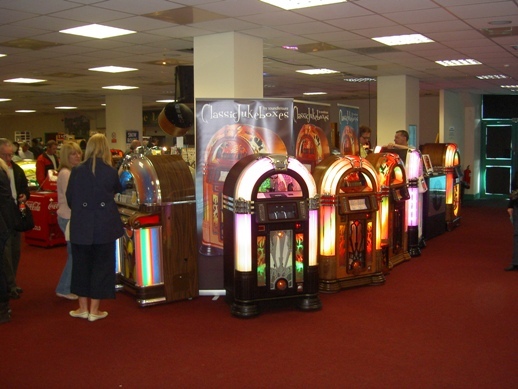 Given the title of the show it was no surprise to see the jukeboxes dominating the display with 50 or so for sale, ranging from five figure priced collectors pieces to modern CD based (but retro styled) machines. There was children's entertainment, a licensed bar, and food and drink at reasonable prices including a hog roast if one was so inclined. 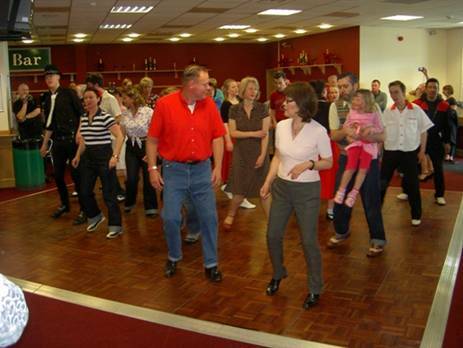 There was also a live swing band and dancing displays from Sussex Swing, pictured here doing a stroll. On the pinball front, however, things were rather leaner. First up was a selection of vintage EMs from Pinball Parlour (soon to open a large pinball and vintage gaming arcade in Ramsgate - more info to come in Pinball News soon). 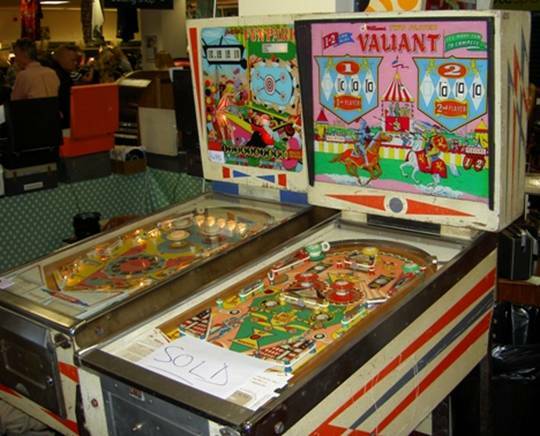 They had five machines on display - Bally Bowl-O, Gottlieb Fun Park and Hot Shot, Williams Touchdown and Valiant, the last of which had already been sold. 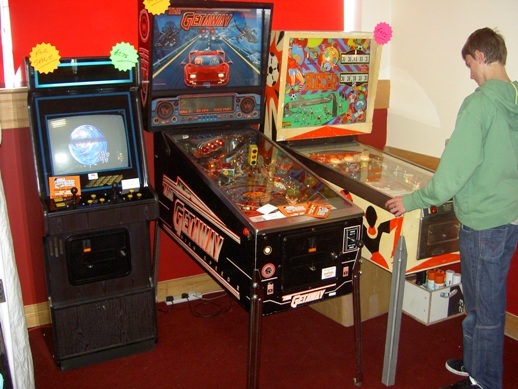 Speaking to Pete from the Pinball Parlour, he said that things had been pretty quiet although there was some interest. He expected more people to contact him after the show, having picked up flyers and realising that they wanted a pinball machine after all. 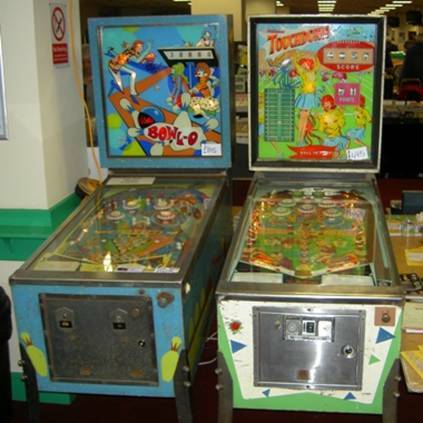 The only other pinball machines were displayed by A.G.Clarke Amusements Emporium from Portsmouth, who had a Gottlieb Soccer and Williams Getaway (which had been sold), along with a MAME cabinet, all on freeplay. 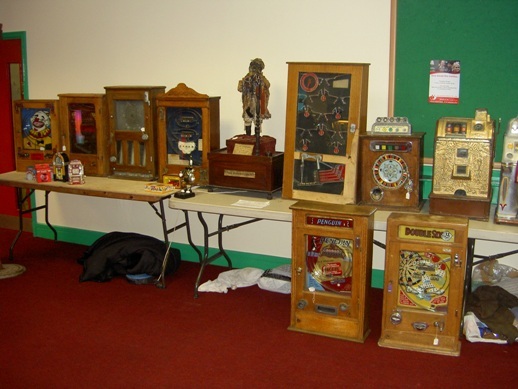 Although there were a number of stalls supplying spares and upgrades for jukeboxes, there was nothing similar for the pinball enthusiast this time. One final item of interest was a very nice collection of upright and wall-mounted machines on display and for sale in one corner of the main hall. They also had an "interesting" automaton called The Exhibitionist which put on an anatomically implausible display in exchange for a penny. All in all a lot less pinball than last year, with a greater emphasis on the older EM games, which probably fit in better with the overall theme of the show than the newer machines.